Joe Seamons grew up listening to his parents playing music. He was enraptured by the musicians and instruments they played at the living room sing-alongs, parties and concerts his parents and their friends would organize. The songs told tales of places and people Seamons knew or had heard stories about. They contained accounts of fishermen and loggers and folks working at the mill in Vernonia. The musicians and folk songs left an indelible impression on Seamons, an impression he is now exploring in his own career as a musician and musical archivist. Seamons is a banjo player who plays music with several different artists, performing a blend of traditional blues, bluegrass, ragtime and folk songs. He has studied Woody Guthrie’s Columbia River songs, written when Guthrie worked for the Bonneville Power Administration. He fronts a bluegrass band called The Renegade Stringband. 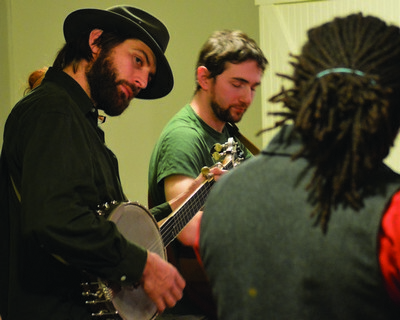 He recently spent several weeks on the road with fiddler Ben Hunter, traveling up and down the Mississippi River region, playing house concerts, learning the roots of local music and soaking up the culture of the region. 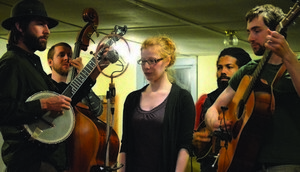 Seamons and Hunter also created The Rhapsody Project, taking folk music into schools and sharing it with young students. Seamons is in the midst of a long and winding musical journey – an exploration of history and culture and reviving old songs – a journey that began right here in Vernonia in a small wooden shack, in an old logging camp at the end of a long, winding gravel road. Several years ago Seamons formed a band called Timberbound, a reincarnation of a previous group of musicians that Seamons grew up listening to. Seamons and the new Timberbound recorded a CD of old songs by the same name. The name Timberbound, the content of the music, and the source of the songs, are steeped in local significance. For many Vernonians the CD and the songs it contains are a treasure and a dream come true. For those unfamiliar with these old songs, it is masterpiece waiting to be discovered. In the mid-seventies Kim and John Cunnick lived about twelve miles outside Vernonia in an abandoned logging camp called Keasey. Both were musicians, living with no electricity or running water, playing music and writing a small collection of folksongs. John was smart and funny – a self-educated and a self-taught musician who was beloved by those who knew him. His untimely death at age thirty in a car wreck was mourned by the wide circle of friends he made in his short time in Keasey. Kim honored his legacy by forming the Timberbound Stringband (later shortened to just Timberbound) with some of their musician friends, Hobe Kytr, Dave Berge and Mark Loring. They performed some of the music John and she had written together. In 1977 Kim published the Timberbound Songbook which contained the lyrics, music and introductions to the songs John and Kim had written and random notes that John had jotted down about being a musician. Timberbound disbanded in 1978 before entering a recording studio to memorialize John and Kim’s songs. Kim moved away and eventually remarried. Kytr and Berge continued to play together and recorded the album Dog Salmon and Rutabagas in 1985, which featured songs about commercial fishing, logging and life in the Pacific Northwest. The music and stories, and especially the songbook that John left behind made him a local legend of sorts. Several musicians recorded his iconic song, ‘Boys of Columbia County,’ but beyond those few tributes to his life and the fading memories of his friends, the legend of John Cunnick laid dormant over the next thirty years. In June of 2010 Kim returned to the Keasey property where she and John had lived and joined Kytr, Berge and Loring for the weekend in a Timberbound reunion. They spent the time visiting with old friends, playing music and even went into a cabin and recorded some of their songs. The musical playing and the melodies were a bit rusty but the spirit was revived. Joe Seamons was there that weekend and was enraptured by Kim’s stories. The Timberbound Project was born. Seamons studied music at Lewis and Clark College. “I was already exploring and performing the Timberbound songs at Lewis and Clark a couple years before the reunion,” says Seamons. Seamons’s explorations and curiosity led him to more deeply explore the lore behind the Timberbound songs. Seamons began gathering musician friends and performing songs under the name Timberbound Project. 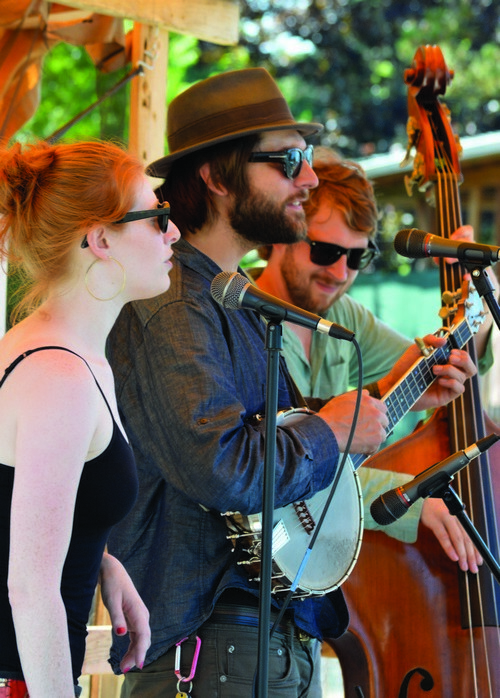 They chose songs that described life in the Pacific Northwest – mostly Kim and John’s songs from the songbook, but also songs by Kytr, Berge, and Woody Guthrie. Eventually Seamons received permission from the original band to change the name of his band to just Timberbound. The new incarnation of Timberbound has captured the tradition, atmosphere and essence of the original string music. The band includes Seamons on banjo, harmonica and vocals, Kate Sandgren on vocals, Jenny Estrin on fiddle, and Gavin Duffy on guitars, vocals, mandolin and more. Seamons and Timberbound have developed a mixture of influences that is grounded in the geography and history of this region. “This music is trying to be texturally like the northwest-extremely varied and very rich and dense and detailed,” says Seamons about the Timberbound music. Seamons says he plans to continue in his quest to gather more stories, information and folklore from the original Timberbound time period and expand on what he still considers the ‘Timberbound Project.’ The possibilities continue to develop and multiply. For Joe Seamons, his musical journey is just beginning.